A city's greatest challenge is its greatest opportunity. Flint happened. We all know about it. Cleveland, Detroit, Buffalo, Pittsburgh, and Philly also happened. Nobody realizes it. For lack of political convenience, awareness of the rest of this lead paint iceberg remains sub-surface. 7% of Flint’s children are lead-poisoned. In Cleveland, the number is 14%. In Cleveland’s historic Glenville neighborhood, formerly the suburban “Gold Coast” of the Rockefellers, the number is 26.5%. If resources were made available for better testing, public health practitioners believe the number could be as high as 40%. Nearly half of children in Glenville could be lead-poisoned. Similar hot-spots abound in most older cities. Lead-poisoning doesn’t just lower IQ. Studies show that moderate lead poisoning can lower IQ by 5 points. 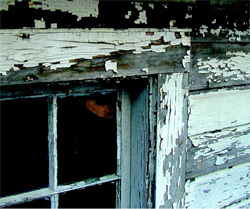 Worse yet, lead paint has been proven to make afflicted individuals more violent. That is the exact part of the brain that lead affects, and it turns out lower IQ isn’t the only way this manifests itself. Lead paint contact soars. Violent crime soars. Neighborhoods are afflicted by lead paint. Neighborhoods are afflicted by violent crime. The NYT is doing their best to raise awareness with a “smoking gun” article, which I put in air quotes because it is nobody’s fault. It is hard to raise awareness for a problem that is nobody’s fault. However, more than awareness, we need to raise funds. Whether broad awareness comes or not is besides the point because this lead contamination crisis shouldn’t be about politics. In fact, the lack of broad awareness and political interest could actually be an opportunity to fly under the radar and cut through the political gridlock. There are funds, just not for lead paint abatement. The lead contamination problem is a historic preservation problem. Outlawed in 1978, the U.S. has made incredible strides toward putting a lid on the lead paint problem. Outlawing leaded gasoline made a big difference. However, the CDC funds to test for lead paint have been cut by 40%, in part because public officials are under the misimpression that we solved this problem. In 2003 the Ohio Legislature created a lead paint abatement fund, as federal resources became rolled back. After the press gala they just forgot to actually fund it. Oops. There is a bill in Congress to provide over $200 million to replace lead pipes across the nation. If only it weren’t for Utah Senator Mike Lee’s legislative hold, citing that Michigan has a budget surplus and doesn’t need help (despite that the bill in mention is for any community impacted by lead pipes). The federal government actually withdrew the City of Cleveland’s 2012 lead paint funding application because they didn’t like the city’s track record in fixing this problem. Not sure how that computes; I’m reminded of when Judge Judy once said “Don’t pee on my leg and tell me it’s raining.” It seems like the Feds defunded the city’s efforts, then refused to fund additional efforts because they didn’t like the city’s effort. Alrighty then. The NYT article that I praised earlier goes after the city for spending $30 million on the Browns Stadium. You can’t unequivocally praise or vilify anyone/anything. They are wrong here. My biggest pet peeve: Arguments that imply that rust belt cities shouldn’t do projects (like every other city) until they solve every basic problem (that exists in every other city). Yes, we have lead paint. However, what does that have to do with the NFL? Take the sports and other amenities away and then not only do Cleveland’s problems get bigger but Cleveland becomes less relevant and less familiar. You gotta be able to walk and chew gum at the same time. However, there is a program that could help: The Hardest Hit Fund. I need to become better-informed about this program, but the Treasury just added an additional $2 billion to what was a $7.6 billion program to address housing problems in the “hardest-hit” communities. The money overwhelmingly goes toward demolishing these communities. That is the predominant federal thinking toward rust belt cities: take their money, tear them down, make their residents move elsewhere, and pipe their water to the south. Ohio in particular just got a big fire hose of $100 million that can only be used for demolition a la “blight removal.” It does nothing to help historic communities. It is in fact a huge detriment to historic preservation, which is the solution to removing contaminants in historic homes. I don’t know why this isn’t obvious. This means you can get funds to erase the abandoned home that nobody lives in, but not a dime for the lead-plastered home next door inside which children are growing up. We have an obsession with tearing down vacant and abandoned properties. The common argument against the HHF is that you’re tearing down these community’s future opportunities. You never know what neighborhood will come back to life next. That said, the better argument is that you’re solving for a cosmetic problem when a much bigger actual problem exists next door. This vacant and abandoned obsession is a new thing, since the 2008 housing crash. As the new kid on the policy block, it has gotten all of the attention. Lead paint is the old kid that can’t seem to ever graduate high school. Nobody wants to deal with it anymore. In Cleveland, this effort (the “blight removal” one, not the lead paint one) is led by the Thriving Communities Institute at the Western Reserve Land Conservancy, of which the very capable CEO is Jim Rokakis. Rokakis is an impassioned crusader for Cleveland’s inner city communities and an expert on urban housing. I would encourage historic preservationists to extend the olive branch and work together with him on finding how these resources could be put to better use. There has to be a better way. Revenue neutral, less homes torn down, more lead paint removed, better housing, and stronger families. What’s not to love? Next week I will be in DC, meeting with Sherrod Brown, Jim Jordan, and Steve Stivers. The agenda is mostly about streamlining the historic tax credit. My agenda will be focused on these Hardest Hit Funds and killing two birds with one stone: Saving the diamonds in the rough amongst our housing stock, and getting lead paint out of homes where children are growing up. Join me. Reach out to Congress, reach out to the Feds (Treasury, Federal Reserve, HUD, etc). Reach out to local leaders like Rokakis and especially your local land bank. Reach out to public health officials – they stand ready, willing to work together with housing and urban development practitioners. In fact, that’s the way forward – partnering with land banks, housing groups, and public health. The goal is a healthy housing program. There is hope. NYC is a model for lead paint abatement. They have effectively reduced lead paint contamination to 2% in what is obviously an older city. They didn’t do it by tearing homes and apartments down. They did it by abating nearly every dwelling unit, with strict inspection standards matched with abatement funds, and repurposing historic housing into healthy housing.